ONE OF our regular participants has just taken a close look at Moonlight’s legalese and published 3 questions about the project. Watch the image at the bottom. Yes, it figures. Moonlight is now being called “Microsoft Moonlight” and this is not a joke. Novell is becoming an attractive takeover target for Microsoft. “Unless [the] distribution wants to risk hot water or out side where Microsoft rules apply,” adds oiaohm in an informal IRC conversation. There is also “the expectation is that users will get the distro from wherever and then download Moonlight from Novell,” remarks the author. Well, guess what? Debian Legal has just received the following from Saul Goode, who had taken a look at Moonlight licensing; it does not seem too good. Fedora (Red Hat) reached the same conclusion after the SFLC had taken a look at the Moonlight licence and did not like what's in it. Since the license for the Debian package must “comply with” the Ms-PL, its license should necessarily offer the patent grants required in Section 2(B). Assuming that a license which complies with the Ms-PL is used — or indeed that the Ms-PL itself used — the question is thus raised, how are patent grants being provided for the MIT/X11-licensed components of the Debian binary package? Without providing such a grant, the package licensing would not meet the terms and conditions of Section 2(B) and fail to “comply with” the Ms-PL. Providing such a grant should demand extra measure be taken with regard to the MIT/X11-licensed code because the authors of that code were not obligated by its licensing to provide such a grant. As a final comment, and one more hypothetical in nature, the Ms-PL makes no distinction between derived and collective works and offers no exemption for “mere aggregation” (as does the General Public License). In lieu of such an exception, we are left with relying upon the interpretation of the courts as to what constitutes a derived or collected work of joint authorship under copyright law. Should a Ms-PL-licensed package be included with a Debian distribution, it may very well be argued that the entire distribution (a collective work) must be offered under licensing which “complies with” the Ms-PL — any inclusion of code for which there is no patent grant could be construed as infringement of the copyrights of Ms-PLed code’s author. “But why should other GNU/Linux vendors be foolishly dragged into Novell’s (and Microsoft’s) trap?”Whereas Debian doesn’t care about anything legal all that much, Canonical is vulnerable because it is a company and it inflicts great pain upon Microsoft's profit. Microsoft does not even need to attack it directly (either with FUD or with legal action) and one regular reader of ours thinks that it inevitably will. All in all, Microsoft hopes that by assimilation it will gain greater legal and technical control over GNU/Linux. It’s the same ol’ embrace, extend, and extinguish (EEE) tactic. It’s about attracting engineers to .NET/C# (or clones) and leading them into the ‘first class’ choice which is Microsoft .NET along with Silverlight, Visual Studio, and Windows. One has to bury one’s head in the sand in order not to comprehend it. Given that Moonlight is basically a port of Silverlight – why are you shocked? Why is this a news worthy note? Anyone send the site a note to see if it’s was simply a clerical error? Moonlight is not a port of Silverlight. You repeat a factual error. The current build does (1.0 is old and not compatible with much). I say “basically” – we’re back to potatoe, potato. As far as repeating factual error – take a look at the document referenced in your article it’s dated Oct 2008 and you’re reporting it as NEW news 6 months later. Also the only reference to Microsoft Moonlight in that doc is the link header at the bottom of the page. And when you follow the link what do you see? There’s nothing on that page that says M$ Moonlight. I would point to the word “implementation” in that line to support my “basically a port” stance. So does de Icaza (and friends) get access to the code of this thing they supposedly “port”? For a verifiable fact, Novell already has access to (visibility) of Microsoft source code*, which leaves the door open to SCO-like allegations. *Source: Justin Steinman, CBR interview, 2007. Access to the code is immaterial – the new code has to implement APIs etc. Moonlight isn’t out doing it’s own thing – it’s doing things the way Silverlight does them. Using your approach putting a rotary engine in a car would cause to to cease being a car – because a car uses pistons. As far as I’m concerned, when you start writing code to implement something that has already written for another platform – you’re doing a port. None of this changes the fact that you’re using sensationalism to bolster your position. By that logic, gnash it a port of Flash. I don’t want to seem like I’m nitpicking, but I disagree. In my view, a port is when you take existing codebase and adapt it to a new platform without significant rewrites. In most simple cases, replace API calls of one platform with API calls of another. For example, replace CreateFile (windows call) with fopen (ANSI/ISO standard C-runtime call), of course taking into consideration different function parameters and their different types. Typical example of an application ported to different platforms is Firefox. On the other hand, what you have just described is a reimplementation rather just a port, Wine being one example of that, literaly written from scratch with no windows code (or Microsoft’s “IP”, IP being misleading term) in it. Maybe it is, I’ve never hear of gnash. If you can feed it Flash files and it plays them, then I’d say yes it’s closer to a port than something new. A wheel is still a wheel regardless of how many times it’s invented. I advise that you look up the definition of “port” (in computing). I agree that traditionally a port refers to altering existing code to run on another platform. But a port also implies changing the code – the code for Firefox on Winblows is different from the code for Firefox for Linux. Both are considered Firefox even with different underlying code. This is why I don’t differentiate between a port and reimplementation. How much code has to change before you get from one to the other? This is why I focus on the end result instead of splitting hairs on how you get there. If I sit down and write a program that takes information from a sound card and creates a file with it, have I created something new? Maybe. If I can open my file with a FLAC or MP3 player – I’d say no. I’ve simply reinvented MP3 or FLAC. Now if my file will only open with my player – then I’ve created something new even though my program is doing something someone else has already done. Logic implies that in certain sentences a singular term denotes it’s own meaning. In short – the “definition” of a word can change given the context in which it’s used. In my world – architect is never a verb – yet it is used as such on a regular basis with in the IT industry. One definition of “port” is a memory location – obviously that’s not what we’re talking about. As someone who routinely deals with various definitions of words and/or ideas, I would expect you to understand where I’m coming from. When definitions change too much, there’s inability to communicate. See 1984. Even the IEEE is strict enough to have an index/glossary for consistent terminology. I think we’re communicating quite well in spite of my “inconsistent” terminology. I notice that you cite IEEE instead of yourself when referring to consistent terminology – smart move. Obviously not because we still argue about “port”. You’ve just proven my point – all of this started around a discussion of the word port. well, I’m nitpicking again, but for me the term ‘port’ also has legal and ownership implications (in addition to technical). Such as, porting is usually done by original owner of code (or, at least with owner’s consent), whereas an alternative implementation is done by a rival or an independent provider. So, in light of that, calling Moonlight a port of Silverlight, to me at least, implies that some of Microsoft’s code (or at least some patented stuff) is being used. 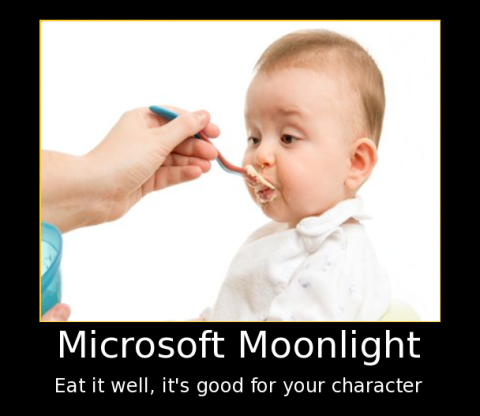 The really sad thing about it, is that’s likely the case here, making Moonlight actually a (partial) port of Silverlight and exposing non-Novell distros and their users to potential Microsoft lawsuits. Whose meaning you conveniently warped to make Moonlight sound like a decent thing. Oops. That last reply was to John. @Myfraudsoft: yes, and don’t forget the codecs. Nowhere in the posts for this topic did I ever state that Moonlight and/or Silverlight is a good thing. In fact, given my definition of port, Moonlight are essentially the same thing. So if one of them is evil so is the other and vise versa. If two applications that render something similarly are “ports”, then Firefox is a port of IE, which is a port of Netscape, etc. I never said render either. FLAC and MP3 both work with sound files, one is not a “port” of the other. If I create and ActiveX program it won’t run in Firefox and if I write a Firefox plugin it won’t work in IE – so there are fundamental differences in the applications – even though they provide the same functionality to the end user. Now if I wanted to create a web browser that supports Active X I’d have to support all the APIs etc in order to do that. If I do that, how much different would the browsers be? The point I was trying to make initially was simply this – in order for Moonlight to work with Silverlight pages it has to implement APIs or whatever the content requires to function correctly – so how different can Moonlight be from Silverlight? Sure you could go and create 5 routines to replace one or create one to replace 5, but do those changes fundamentally change the application? But a port also implies changing the code – the code for Firefox on Winblows is different from the code for Firefox for Linux. Moonlight is not taking Silverlight code. Try reading the rest of my post Roy. BTW – I noticed your ad banner is displaying IE 8 – does that automatically imply that you are now a MS shill? Is the ad space on this site provided for free? If not, I think I see the beginning of a long dark road…. No, that’s Google incompetence.. It’s not enough to block just Microsoft sites (Which we do) because there are too many domains and partners. So you’re going to return any revenue generated by displaying a M$ related ad? Shane does the Google ads to pay the hosting bill. Shane, do you want help filtering out these things? I can try to write up a regular expression or something. Jose, thanks but, we revisit this every once in a while, and the ads don’t bother me cuz I use Adblocking in Konqueror and Firefox. Just like I abhor censoring comments, I feel likewise about the ads I suppose. Remember, there are quite a few pro-Novell and pro-Microsoft visitors, some of whom may genuinely be interested in whatever they’re saying/selling, even if you’re not. Maybe we should have a static spot where it collects my regular responses to these questions, But, JohnD, No – Roy gets none of the Ad revenue for this site, despite my offering a few times early on for him to ‘monetize’ his postings. The ads are mine, I use them to offset the costs of hosting (the same account that also hosts edu-nix.org, so I suppose it could be said that BN also ‘pays’ for that these days, with me not nearly as often having to make deposits). Of course, we’re seemingly always an inch away from getting kicked off the net, and who knows what a bigger host will cost, but right now we break just about even but sometimes underfund due to Google’s waiting to pay after you clear $100. Shane, if hosting costs more than the ads pay, let me know and I’ll mail a cheque. nah, like I said, we do just about exactly right. there was a time a while ago where the funds went thin, but we’re cool at this point. if the new frontpage really eases the load on the host, we should be fine for the foreseeable future. OK, but what abut Microsoft’s patents? Such as patented codecs. Without them it’s not really compatible with Silverlight. I don’t have proof, but my gut tells me that the Moonlight code has bears more than a passing resemblance to the Silverlight code. Assuming the codecs are included in Moonlight – one could consider that using original source code. I don’t know how codecs are written, but knowing M$ – I doubt they work on Linux without some kind of modification. You’ve heard both side of the port issue so you can make your own decision about Moonlight’s true nature. I will tell you that I use SLED 11 and Moonlight and I like them both. They give me the ability to do 90% of my day to day things without using Windows. Right now I have a couple XP VMs to help me with Netware access and Lotus Notes Development. Should the day come that M$ tries to hose everyone via Suse – I’ll move to another distro and install VMWare and soldier on. I don’t care what ads you post, if you can make a buck showing an M$ ad – more power to ya. I, for one, don’t think you’ve turned to the dark side because of it. I simply saw humor in an M$ ad on an anti M$ site. Made even more humorous given some someone’s penchant for drawing links between posters and M$ for things like that. Providing an honest service in exchange for money is the heart of capitalism and I’m all for it. And EEE techniques ,because only microsoft servant knows about .net implementations. Other people which try to implement .net , like dotgnu will not get good implementation like mono. Of course. It’s ‘too’ libre and disconnected from a company to be tolerable (from Microsoft’s POV). It also has different goals. A clone: Making a software that does the same thing (looks similar etc.) as another piece of software. This matters due to things like reverse-engineering and clean room implementation. If you’ve taken code without permission you’ve got a derivative work. If you’ve done it all by yourself with a unique implementation, you’ve got a clean room implementation. Saying things are a port, would really spread confusion for no reason. Calling all word processors ports of each other, or spread sheets, etc. Would be utterly false. However, looking at GPL’d programs, i.e. videolan, and see how many platforms it can run on. Ditto for GNU/Linux distributions that run on x86, arm, sparc, etc. ALL the software that runs on multiple platforms in that case is ported. If you want to continue the word port, there is an implication that source code of the “parent” application is used. So I’d say stop it, but surely there will be a discussion about it as occurred here. Lastly, about the IE 8 advert. Take the money from MS while you can. They’ve certainly taken mine with the “bundling” of its OS. P.S. Internet Explorer is a port of Spyglass Mosaic, for those interested. If anyone as a list of software that MS “acquired” it would be a neat article. Apart from QDOS, what else? And already taken to the cleaners. Yes, that’s my understanding of “port”. 1. It came out of the Interop lab. 2. I believe I heard that the dev team consulted with M$ on it and given the deal they could very well have had access to Silverlight code. I’m hard pressed to believe it’s something truly new and unique. Given this site’s purpose I’m surprised that anyone on here would consider it anything other than a port. Actually viewing Moonlight as a port would add more fuel to the fire. I’m also mildly amused at how Roy in particular is focused on the “exact” definition of port when he was rather liberal in his definition of “New” with regard to this story. Honestly. While it may be new to you because this is the first time you heard of it, that doesn’t make it new in the grand scheme of things. The document is 6 months old and in that time I’ve never seen anyone refer to it as M$ Moonlight – not even on the Mono/Moonlight page. Anyone truly interested in the facts would contact Novell or the Interop page and raise the question. All that being said – I grow weary of this “discussion” . I’ve stated my opinion – all are free to agree or disagree as they wish.